The Texas shooter used a AR-15 platform rifle. Americans are grappling with yet another massacre after a Texas church's Sunday morning services were interrupted by a masked gunman who sprayed parishioners with bullets from an AR-15 platform rifle. Air Force veteran Devin Kelley killed 26 people — many of them children — and left 20 other people injured, in what authorities have called a domestic situation. The murder weapon he used, authorities said, is the AR-15 assault rifle, which is popular with hunters. 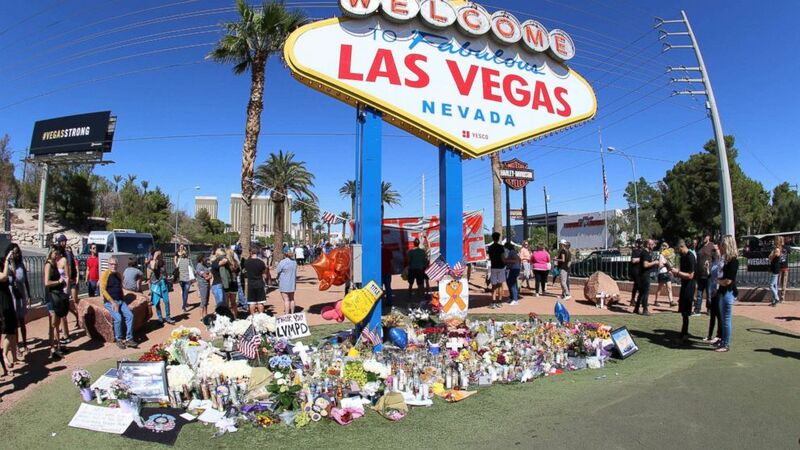 (gotpap/starmaxinc.com via Newscom) Memorials and tributes are pictured Oct. 6, 2017 in the aftermath of the mass shooting on the Las Vegas Strip on Oct. 1st, 2017, in Las Vegas, Nevada. The AR-15 rifle and similar makes are favored by shooters for their magazine-fed, gas-operated semiautomatic action. These rifles can be customized. The initials "AR" stand for "ArmaLite rifle" — not to be construed as "assault rifle" or "automatic rifle" — which is based on the AR-15 invented by American engineer Eugene Stoner of ArmaLite Inc. in the late 1950s. From its inception, the AR-15 has been prized for being lightweight, accurate and able to fire multiple rounds. The AR-15 isn't subject to the National Firearms Act, passed in 1934, which bans the possession of machine guns by civilians. What's more, Ronald Turk, the associate deputy director and chief operating officer of the Bureau of Alcohol, Tobacco, Firearms and Explosives, released a report this year inadvertently lessening the stigma against AR-15s by referring to them as "modern sporting rifles." "These firearm types are now standard for hunting activities," he wrote. He acknowledged, however, that hunting is "vastly different than what it was years ago" and there should be a "reissue" of the 20-year-old "New Sporting Purpose" study to re-examine safety interests. These results should be made public to "address any concerns," he argued. According to a National Rifle Association blog post titled "Why the AR-15 is America's most popular rifle," the weapon's design was mimicked to create the automatic M-16 rifle, which is issued and used today by American service members. The AR-15 was likened to "weapons of war" by then-President Obama in the wake of the Pulse nightclub shooting in Orlando, Florida, where 29-year-old Omar Mateen slaughtered 49 people and wounded 53 others in June 2016. And it's the same rifle that keeps appearing again and again as a murder weapon in mass shootings. 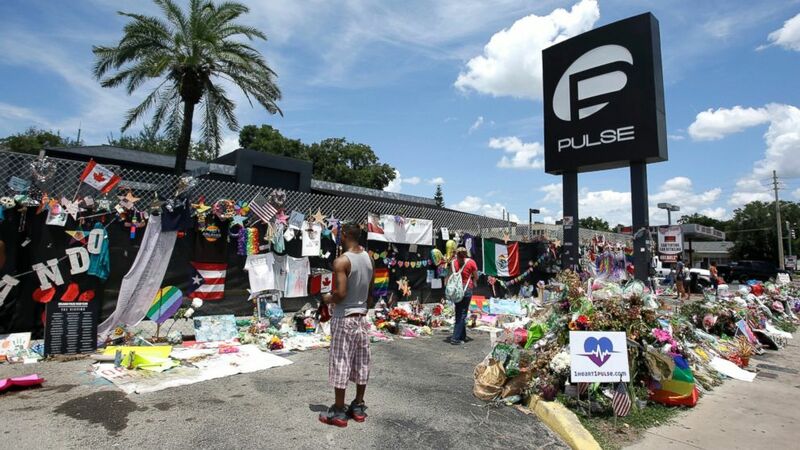 These are the five most recent AR-15-involved mass shootings in the U.S.
(John Raoux/AP Photo) In this July 11, 2016, file photo, visitors at a makeshift memorial outside the Pulse nightclub, the day before the one month anniversary of the mass shooting, in Orlando, Fla.
From his two-room suite at the Mandalay Bay Resort and Casino, Stephen Paddock, a 64-year-old retiree and an avid video poker gambler, fired on hundreds of country music fans attending an outdoor country music festival. The killer checked in on Sept. 28 with 10 bags and at least 23 guns, including AR-15-style and AK-47-style rifles and a large cache of ammunition. Some of rifles were rigged with bump stocks, kits that allow a semiautomatic rifle to mimic the firing of an automatic. Paddock set up surveillance cameras inside and outside his suite and killed himself, authorities said, when SWAT teams responded to his room. 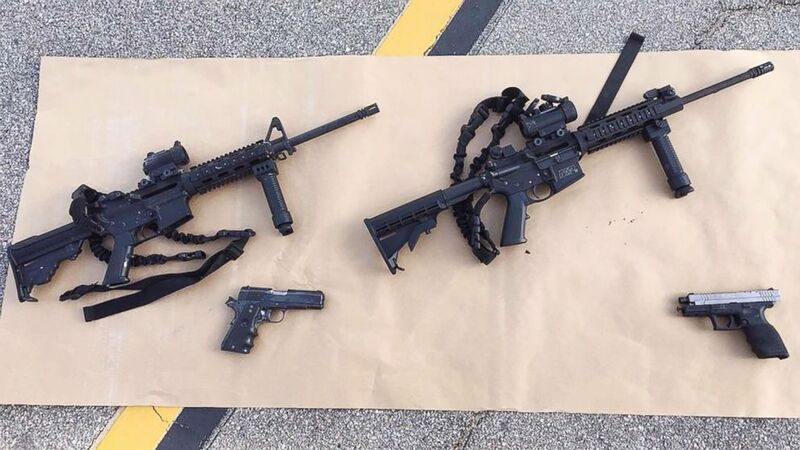 (San Bernardino County Sherrif's Department FILE) Four guns are seen near the site of a shootout between police and suspects in the San Bernardino shootings, Dec. 4, 2015, in San Bernardino, Calif, in this handout photo provided by the San Bernardino County Sherrif's Department. In the early hours of June 12, 2016, 29-year old Omar Mateen crashed a night of partying at Pulse, a gay nightclub. Mateen took clubgoers hostage before killing them. He died after engaging in a firefight with authorities. The massacre was staged with an AR-15-style rifle and a handgun from a federally licensed dealer near Mateen's home in Fort Pierce, Florida. (Christian Murdock/The Gazette via AP) The rear window of a Colorado Springs Police car is shattered after a shooting, Oct. 31, 2015, in Colorado Springs, Colo.
Married couple Syed Rizwan Farook and Tashfeen Malik stormed the Inland Regional Center during a San Bernardino County department of public health training session and holiday party to shoot and kill his co-workers. Farook was an employee with the division and had worked alongside many of the victims for years. According to the FBI, he used two semiautomatic AR-15 rifles in the attack. 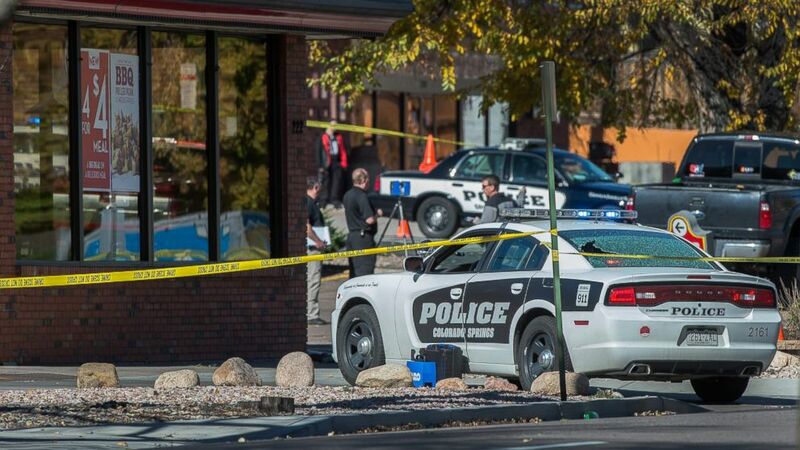 After the rampage, Farook and Malik were killed by police as they tried to make a getaway. 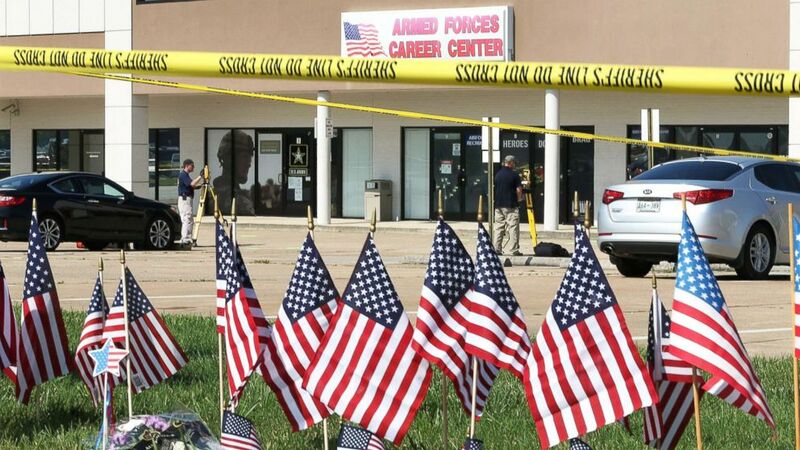 (Joe Raedle/Getty Images FILE) Members of the FBI Evidence Response Team investigate the shooting at the Armed Forces Career Center/National Guard Recruitment Office on July 17, 2015, in Chattanooga, Tenn.
That Halloween morning, Noah Harpham, 33, armed with an AR-15 rifle, a 9-mm pistol and a .357 revolver killed three strangers — a man and two women — before being fatally shot by police. Witnesses reported Harpham walking down a street carrying a rifle and two gas cans. Mohammod Youssuf Abdulazeez, 24, shot and killed four Marines and wounded three other people when he opened fire on a Naval Operation Support Center and an armed forces recruiting center. Abdulazeez of Hixson, Tennessee, was killed in a firefight with responding police officers after the rampage. Investigators said Abdulazeez, a University of Tennessee at Chattanooga graduate, possessed a Kalashnikov variant rifle, a Smith & Wesson handgun and a Saiga-12 semiautomatic shotgun. An AR-15 semiautomatic assault rifle was pulled by investigators from his family's home.